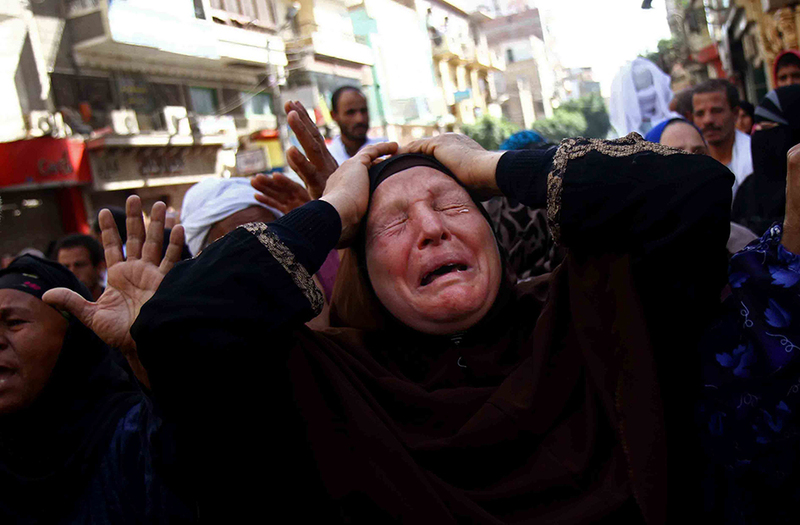 Today (28 April 2014) an Egyptian court in Minya sentenced 683 alleged supporters of the Muslim Brotherhood to death, including leading members of the Muslim Brotherhood. They were found guilty of attacking the Adawa police station in August and killing a policeman following the violent dispersal of the pro-Morsi sit-ins in Nahda and Rabaa Squares. Last month 529 Muslim Brotherhood supporters were sentenced to death for attacking a police station in the same province despite evidence that many defendants were not present at the scene on the day in question and despite claims by some defendants that they are not Brotherhood supporters. 492 of the March death sentences have now been commuted to life imprisonment. Following the ouster of former president Mohammed Morsi anti-coup protests have continued throughout Egypt. 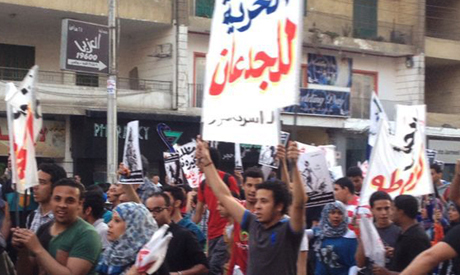 A large component of these protests have been calling for the reinstatement of Mohammed Morsi. The State has used security rhetoric (with the backing of a large section of the Egyptian population) to clamp down on the Muslim Brotherhood and anti-coup protesters and herald the return of the military-police state. Through the security rhetoric the military regime manufactures enemies to justify its continuing hegemony, ensure obedience and liquidate political resistance. It’s a strategy learned well from colonial masters. Regardless of our political opposition to the Brotherhood and the return of Morsi, the repressive tactics of the State against protesters and State-sanctioned murder of political opponents must be opposed. The military regime tolerates no dissent. Also today an Egyptian court banned the April 6 Youth Movement which played a key role in the 2011 uprising against Hosni Mubarak. The Cairo court accused the group of espionage, tarnishing the image of the Egyptian State and conspiring against the country’s national interests. Ahmed Maher and Mohammed Adel, two prominent activists of April 6 Movement, have been sentenced to three years in prison for violating the new protest law which requires demonstrations to have a police permit. On 22 April the trial of three Aljazeera journalists accused of links with the Muslim Brotherhood and “spreading false news” was adjourned until 3 May. Peter Greste, Mohammed Fahmy and Baher Mohamed have been in prison for 121 days. Another Aljazeera reporter, Abdullah El-Shamy, arrested on 14 August whilst covering the Rabaa sit-ins has been on hunger strike since 21 January. In a letter from prison El-Shamy stated “I choose to be on hunger strike to send a few messages; one to journalists who choose to falsify the facts and cover up for the violations of freedoms and media, the other to the Egyptian junta that I do not fear losing my life in my struggle for freedom. Nothing will break my will or dignity.” El-Shamy’s health is reported to be deteriorating. On 28 March, 22 year old journalist Mayada Ashraf was shot and killed whilst covering clashes between Muslim Brotherhood supporters and police in eastern Cairo. Eyewitness claim the shot came from security forces. The American based Committee to Protect Journalists has designated Egypt as the third most deadliest place to be a journalist after Syria and Iraq. The message to journalists is clear: only State sanctioned narratives will be tolerated. On Saturday 26 April non-Islamist opposition groups united and marched to the Presidential Palace calling for the end of the protest law and for the release of detainees. They chanted against both Sisi and the return of Morsi, rejecting both a military and religious State, reaffirming their commitment to the original goals of the revolution for freedom, dignity and social justice. At least 16,000 people have been arrested, more than 2,500 killed and 17,000 wounded in the government crackdown since the ousting of Morsi. Down with the fascist military regime! Posted on April 28, 2014, in North Africa and tagged Egypt, Egyptian Revolution, Muslim Brotherhood, SCAF. Bookmark the permalink. 1 Comment.